Prints rarely receive the same attention as paintings. Yet printmaking is a demanding medium, one that requires extensive technical knowledge and collaboration. Robert Motherwell was unusual among his Abstract Expressionist contemporaries because of his interest in and mastery of printmaking. 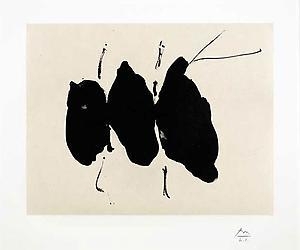 Motherwell produced his first prints in 1943 and returned to printmaking in the early 1960s at the invitation of the Universal Limited Art Editions (ULAE) print studio. His later work with Tyler Graphics, Gemini Graphics Edition Limited (G.E.L.) and others evolved into an impressive body of almost 500 prints. Throughout his career, Motherwell developed a network of relationships with workshops and presses, eventually purchasing his own etching press and hiring a Master Printer to work in his studio. A key figure in postwar art, Robert Motherwell was the youngest of the first-generation Abstract Expressionists. Born in Aberdeen, WA in 1915, Motherwell initially planned to be a philosopher, earning a Bachelor's degree in the discipline from Stanford University and later enrolling in a Doctoral program at Harvard University. He left academia and devoted himself to painting following a trip to Europe in 1938. In addition to his groundbreaking work as a painter, Motherwell was an accomplished author and critic, as well as a prolific printmaker. His graphic work distinguished him as an innovator and producer of stunning imagery. By the time of his death in 1991, his career had been widely celebrated with countless exhibitions at institutions including the Museum of Modern Art, NY and the National Gallery of Art, Washington, DC. 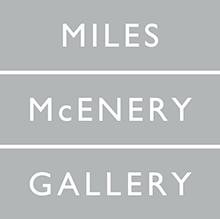 The Asheville Art Museum is pleased to present an exhibition examining Robert Motherwell's accomplishments as a graphic artist while also examining these works in the larger context of his artistic production.